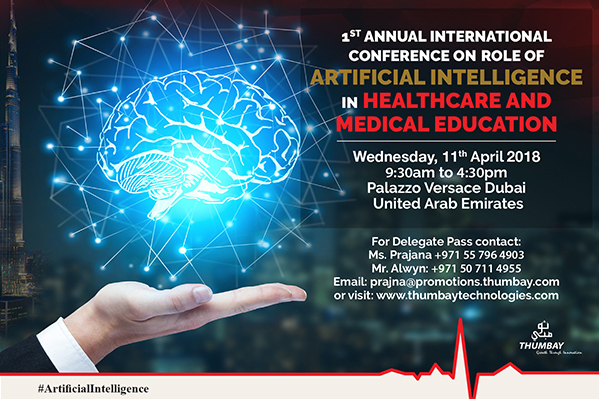 More than 300 leaders and experts from healthcare, academic and the Artificial Intelligence (AI) industries will converge in Dubai on 11th April 2018, to explore the scope and opportunities of AI in healthcare and medical education. Hosted by Thumbay Technologies – the leading IT services company owned by Dubai-based international conglomerate Thumbay Group – the conference will have expert speakers from the US, UK, Switzerland, UAE, India and Australia. His Highness Shaikh Mohammed Maktoum Juma Almaktoum, Chairman, MBM Groups, Dubai will be the chief guest. Dr. Thumbay Moideen, Founder, President of Thumbay Group will preside over the function. 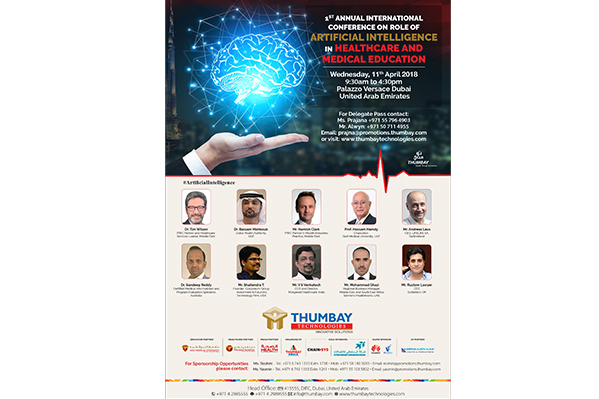 Mr. Akram Moideen Thumbay, Director Thumbay Technologies says that attendees of the conference can expect to see next generation technologies and strategies from the world of Artificial Intelligence, with focus on medical education and healthcare, being showcased. Participants will also get the opportunity to explore and discover the practical and futuristic implementation of AI in healthcare and medical education. The conference is expected to be a platform for industry leaders to come together and share ideas on the practical aspects and techniques of AI from across the globe. We are looking for international tie-ups and are going to sign strategic partnerships during the conference, said Mr. Akram Moideen. We are inviting leading companies and services providers in Artificial Intelligence, Robotics to join hands with us be our partners, he added. Speakers include Dr. Tim Wilson, PWC Partner and Healthcare, Services Leader, Middle East, Prof. Hossam Hamdy Chancellor, Gulf Medical University, UAE, Dr. Sandeep Reddy, Certified Medical Informatician and Program Evaluation Specialist, School of Medicine, Deakin University, Australia, Dr. Bassam Mahboub from Dubai Health Authority, UAE, Mr. Andreas Laus, CEO, LIFELIKE SA, Switzerland, Mr. Hamish Clark, PwC Partner in Health Industries, Practice, Middle East, Mr. Shailendra Kumar, Founder, Colosseum Group, Investment & Futuristic Technology Firm, USA, Mr. Mohammad Ghazi, Regional Business Manager, Middle East and South East Africa, Siemens Healthineers, UAE, Mr. V. S. Venkatesh, CEO and Director, Morgenall Healthcare, India and Mr. Rustom Lawyer, CEO, Scribetech, UK. Apart from the talks, there will be a Panel discussion on Artificial Intelligence – Decoding the Future. The conference will be held on 11th April 2018 at Palazzo Versace, Dubai. Participation is ‘by invitation only’. Gulf Medical University, Ajman, UAE is the educational partner and the Thumbay Hospital network is the healthcare partner of the conference.